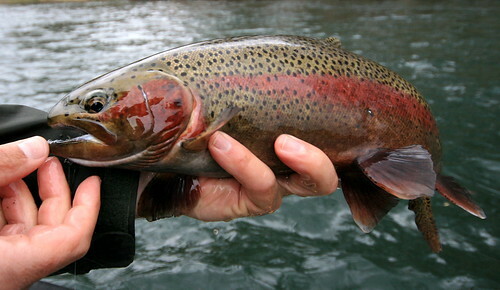 Our friend Greg Hatten writes about his “home water,” Oregon’s McKenzie River. 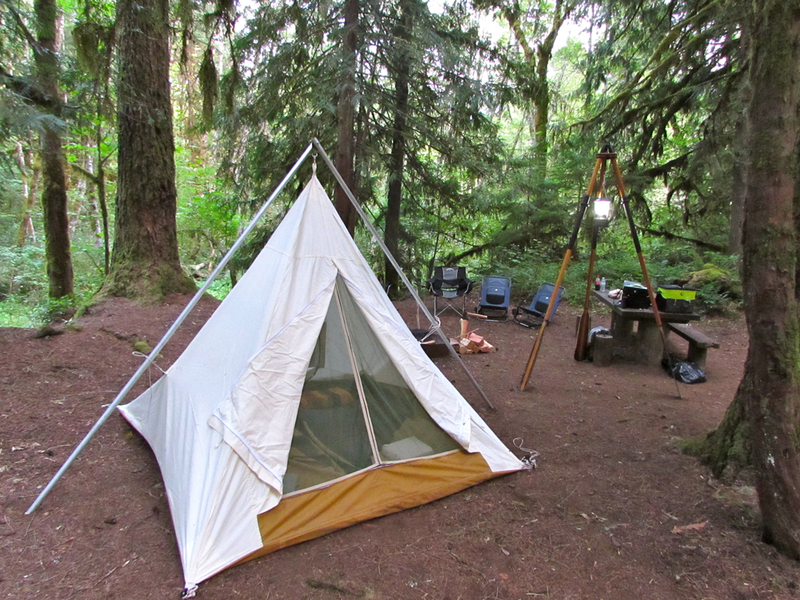 Greg uses our Yakima Camp blankets and National Park Series blankets on his expeditions. 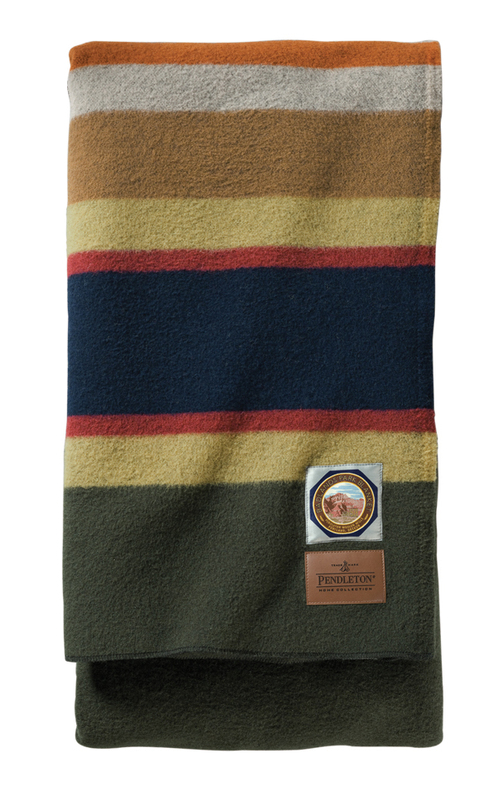 You can learn more about the Parks and the blankets they have inspired here. But for now, just enjoy a trip on the river with Greg. 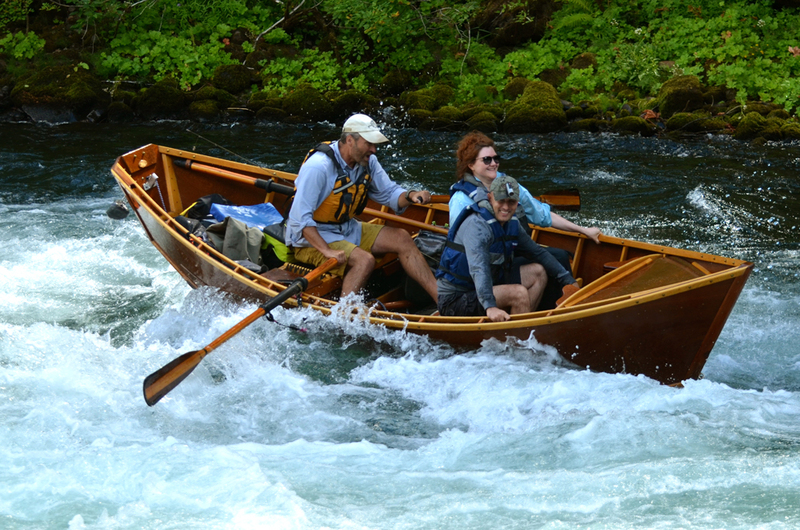 The McKenzie River in the Cascade Range of Oregon is my “home – water” – it’s where I learned to row a drift boat and where I feel the most comfortable on the oars. Her icy waves, aqua pools, moss covered boulders and challenging rapids bring me back again and again. It’s a rock garden playground for a wood drift boat and a 90 mile paradise for native redside rainbow trout as the river makes its way down the valley and folds into the Willamette River on its way to the Pacific Ocean. Tall stands of Douglas fir, western hemlock and red cedar line the banks and steep hills forming a solid curtain of subtle shades of green on both sides of the river. 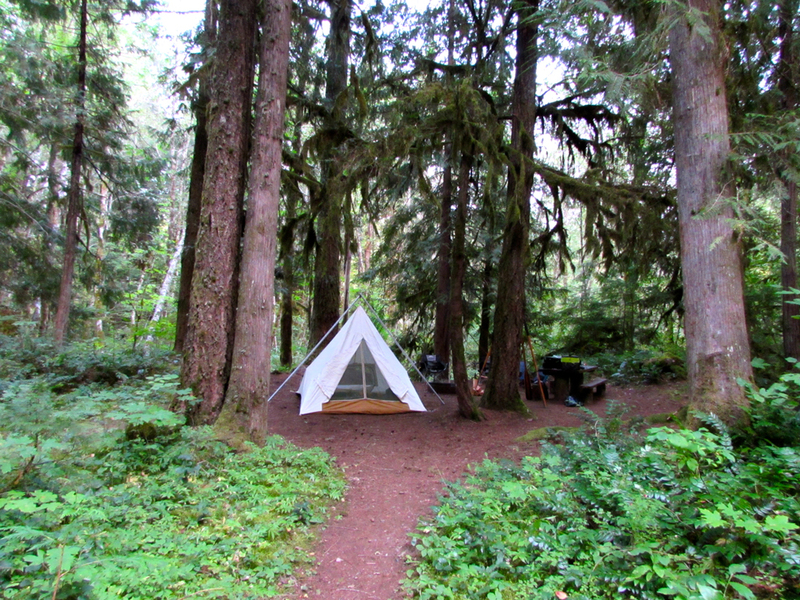 As the McKenzie cuts through the Willamette National Forest, there are small pockets and openings within the dense trees to camp alongside the river. For 8,000 years, this river was home to Native Americans – mostly of the Kalapuya and the Molala tribes. In 1812 it was explored by the Pacific Fur Company and was named for the expedition leader, Donald Mackenzie. Camping in canvas and wool seems appropriate in this place and my mind drifts back in time 200 years as I set up the tent in a small clearing of towering trees. With so little evidence of civilization around us, it’s easy to wonder what those explorers in 1812 experienced as they reached this spot on the river, what they saw, how they camped, how they fished, and cooked and ate. I spread a Pendleton blanket (Badlands National Park) over the floor of the teepee tent, unfurled the cowboy bedrolls and enjoyed the coziness of the shelter for a moment before starting a campfire . The oars from the boat become a triangle “lamp stand” when lashed together and the camp lantern hanging above our campsite gives off a warm glow casting playful shadows on the ground and tent. It’s a comfortable camp filled with nostalgia and authenticity. Most of my river guests prefer an overnight experience that includes running water, indoor toilets, soft beds, clean sheets, and WIFI. Not these guests! These guests requested a unique and rustic adventure filled with wood boats, canvas tents, wool blankets, and warm campfires. They wanted to get away from cell phones, computers, and modern conveniences. 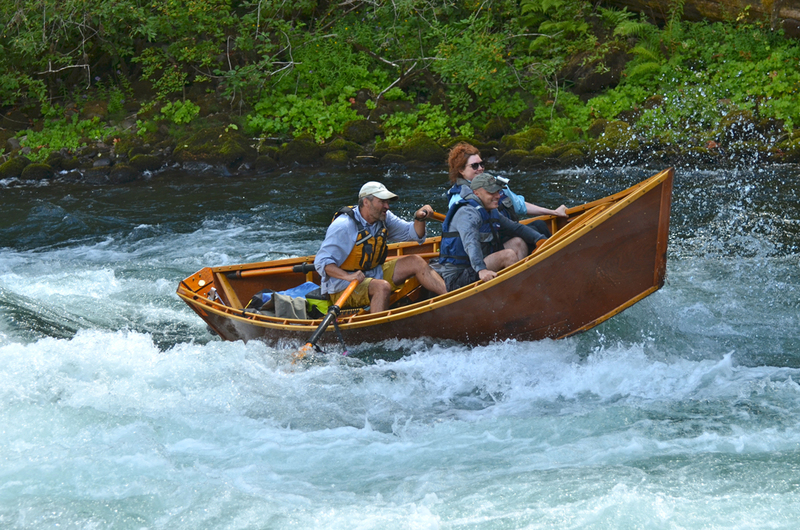 It’s an unfiltered McKenzie River experience they seek – a direct connection to the explorers and pioneers that originally explored this McKenzie River Valley. That evening we ate smoked salmon, fresh vegetables, pasta, and organic strawberries that were so sweet they tasted like they’d been soaking in a brine of sugar water. After dinner the smoky smell of the campfire complemented the scotch we drank as we talked about the day and made our plans for the next. Our canvas tent and bedrolls sat on a layer of pine needles and loose soil that created such a soft quiet cushion, sleep came easy. We inhaled the evergreen aroma of pine and I wondered if it was the same smell two hundred years ago. The sounds of the running river were close enough to hear but not close enough to disturb as we slumbered away under a canopy of dark swaying boughs overhead. Morning came early and we broke camp quickly so we could get to the pressing business of river running in a wood boat. The Class III Marten’s Rapid was on our river agenda and on my mind all morning as we navigated minor rapids and fished our way to the top of this most treacherous rapid on the McKenzie. As usual, we heard it before we saw it with its low growl that warned of danger. Two days before us, a drift boat hit the left wall so hard it left a mark on the rock – the moment of impact was captured by a photographer below the rapid and the picture was plastered all over web sites and facebook. When the river is low in mid summer, the slot gets narrow and the holes get deep so we pull into an eddy behind “house rock” at the top of the rapid to catch our breath and confirm our line. The path looks more complicated than usual. We pushed out of the eddy and picked up speed. We put the nose of the boat as close to the “can opener” rock as possible and then pulled hard to miss it by a foot. A rebounding wave off the rock knocked us off course a little and sent us flying towards the wall on the left. Digging the oars deep, slowed the boat just enough to narrowly miss the wall. We immediately dropped into a series of sharp swells that tried to swallow the boat and soaked us with breaking waves over the prow. It was a roller coaster ride with two big holes at the bottom, which we threaded and then pulled over to dry off and bail water out of the boat. Quite a ride!! 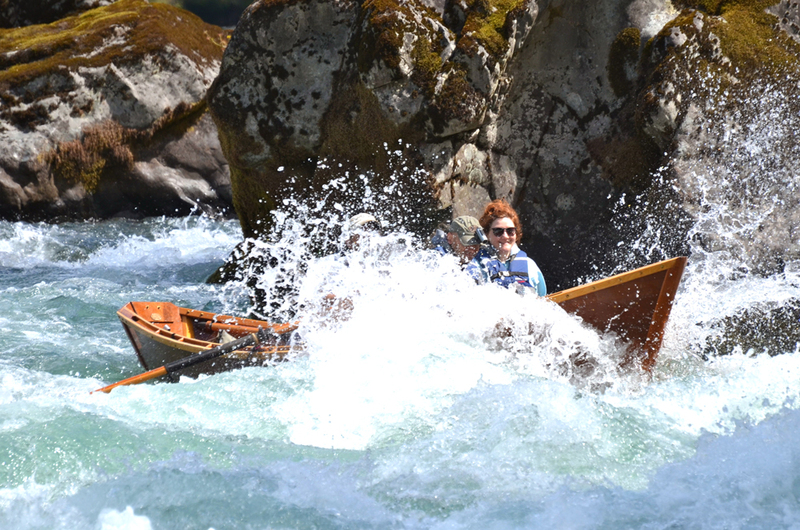 Some of my favorite rapids on the river are below Marten’s. They are technical but not brutal and the boat moved with elegance – threading rocks, skirting eddies and working in perfect harmony with the river. The afternoon was hot and sunny as we settled into a rhythm of rowing rapids and fly fishing for trout. The last fish brought to the boat that day was a beautiful native redside rainbow trout, a fitting end to a throw-back adventure of Canvas & Wool on the McKenzie.